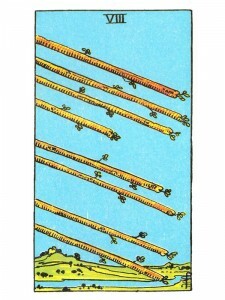 Eight of Wands suggests that there will be acceleration in your affairs now. News is coming in and there will be “orderly growth” with much cosmic help. You are coming to the completion of your goals – you have reached the end of your journey and your efforts will now be completed as messages are exchanged, action is taken, proposals are made and accepted and mutual settlements will be reached. Any block or obstacle that you are experiencing internally or externally can be transformed or resolved now if you communicate directly, for you have found your focus and have the ability to express your energies creatively. Your goals are within reach and new ideas will bring satisfactory conclusions. Enthusiasm can sweep people off their feet and get them moving with you. Your freedom of speech and personal expression are vital to you; however – unleashed, your imagination can flow unchecked – a burst of energy felt as an “urgency to get moving” or a frenzy of activity. Gentle these impulses with quiet meditation and the effort of self-control. Blend all of your opposite traits and skills into a harmonious whole. Establish and affirm the vision of perfect harmony. Find your genius – inspire, relax and heal others – help bring them into their own harmony. Here is the level of emotional drive and commitment to matters spiritual. The love of God moves you as the higher emotions put you to work for the Spiritual Plane. Major creative/spiritual breakthroughs are possible. Rapid growth, High level of energy and strong sense of purpose. Your course is well plotted and you busy yourself now implementing it. Spiritual activities increase as devotional/ritual assume greater significance and take up more time and space in your regimen. Your spiritual foundation is on the move – agile and light on its feet. The same penchant for order that ran through the level of Fours is at work here, only more so, but there is little pause for order in and of itself. Here, order is the expected norm and is maintained per diem ingrained into your habits. No pauses are necessary to put things in order. One foot walks on the foundation above in spirit, the other foot walks on the foundation below on earth. This power is especially formidable in the Suite of Wands, where the Eight acts as receiver from above, transmitter to below. The means for expressing these messages permeate the world of the artist, the writer, the sage/teacher and the gifted channel/medium. The energy of Tantra Yoga contributes here. inner, spiritual communication. What are you rushing into? A relationship, a new direction for growth, a belief or philosophy? What are you being “carried away” by or overwhelmed with? What do you feel the urge to move on quickly? What do you need to tell others about? Next to Sun: Good vibrations are present – you can anticipate a pleasant gathering – emit your charm. Next to Lovers: Promises will be given now – your future is being discussed – warm, genuine conversations taking place. In the first position: Although you do not have to be a vagabond, a spiritual traveler you will be. In conscious thought, in daydreams, in meditative trance, in the dreams of deep sleep, in astral travel – you will roam the ether following your quest to know more of your God. You will return home time and time again to share your latest discoveries with those who choose to turn into your channel. In the second position: Although your surroundings and personal habits are relaxed and natural, they are nevertheless very organized and that is one of your strongest points. You may have considerable belongings, but everything you have is working in regular use, be it an old reference book or a cooking utensil you collected on your last trip. In the third position: Listen and you will hear from your heart the ever soft whispers from the ether reaches of our space and time blowing through the trees in the inner courtyard of the garden of Eden. In the fourth position: The deep appreciation of things in the now, of beauty intrinsic in nature and man, is paralleled by a desire to see the beauty of the unseen. This is the desire to see God that infuses all great artists’ work. This emotional path is highly sensual. In the fifth position: You are very aware of the richness of possibility around you. There is an abundance of information, possibly an abundance of sources. In the sixth position: Strong demands are being placed on your emotional house, for sincere commitment to the highest of standards by you and all those around you sharing this path. In the seventh position: In the near future you will be washed with a wave of confidence to urge you forward. Your mental projects will be clear and flow much more easily afterwards. In the eighth position: You are moved, perhaps not with a moving van, but nevertheless moved. Everything has probably remained the same here in the Physical/material Plane, at least for now. Spiritual change inevitably brings change to all the planes – sometimes the change is subtle and sometimes it is not. In the ninth position: Inspiration has struck and with a mighty hammer. There may be more information than you think you can handle. You are in the midst of that wonderful moment of original creativity when the sheer magnificence of what you have just been handed humbles you to acknowledge a source outside and above you, but at the same time you also are intensely aware that it is indeed you as well operating as creator. In the tenth position: The order and organization that you need to move forward will be easy to achieve and your heart will provide all the energy you need.